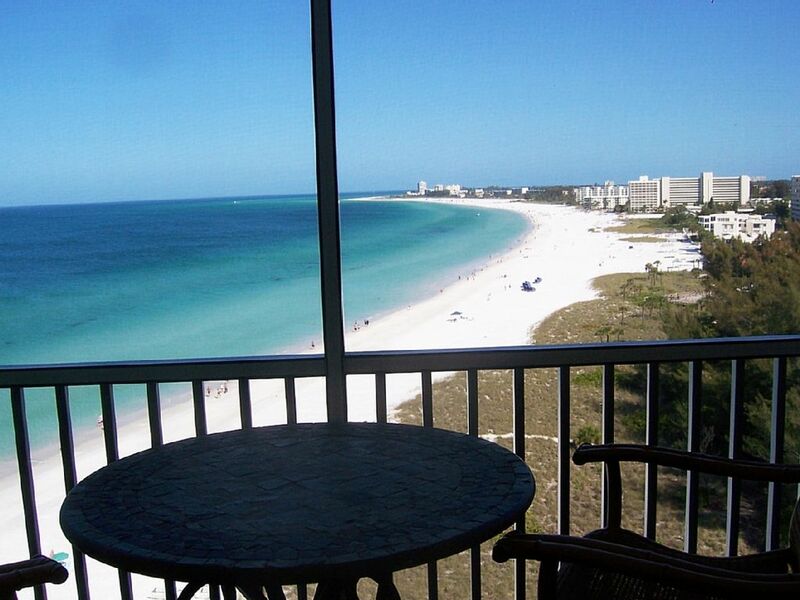 Luxury penthouse condo, located directly on the Gulf of Mexico on the island of Siesta Key in Sarasota Florida. The condo unit has all the comforts of home with breathtaking views from every room. Relax on your 32 foot screened- in lanai and witness beautiful sunsets. Enjoy two heated swimming pools, one direct oceanfront. The condo is literally just steps to the beach and boasts THE most requested view on the island. Conveniently located approximately 20 minutes from Sarasota International airport (SRQ) or midway between Tampa (TPA) or Fort Meyers (RSW) airports. Theme parks such as Disney or Universal are only a 2 hour drive away in Orlando. we loved staying in this condo! just steps to the most amazing beach! very convenient to everything...we walked everywhere! The owners are very attentive and helpful if you have any questions or concerns! Condo is beautifully decorated and very nice and clean! we will definitely be returning! What a wonderful review, thank you. We enjoyed you as guests and delighted you have already booked for next year. In fact, returning guests are a powerful testimonial to our customer service and the quality of our condo on the beach! It was an absolute delight staying here. The condo is unbelievable, and the view is breathtaking. We enjoyed it all. What a gorgeous place on the beach! Cannot say enough! We spent a lot on time on the balcony, because between the view, and listening to the ocean, we could have just slept there too :). Everything is renovated, and so charming. The private beach is perfect, just a few steps away which was so convenient. The owners were wonderful to work with, and very helpful. Debbie was very prompt in answering our questions, and guiding us with suggestions for fun things to do in the lovely Siesta Keys. It was truly such a great experience, that we hope to be able to return here again. Thank you so much for sharing your condo with us! We are delighted you enjoyed your stay. We strive to provide a top notch rental experience, which starts with a super clean up-to-date condominium, coupled with fabulous customer service. Thank you for the kind words. I do my best to make sure every guest's stay is a special time. The best testimonials are from guests who come back year after year! Thank you. We chose this apartment because of its prominent advertising about its beautiful lanai overlooking the beach. But when we arrived at the condo, we discovered that the entire building is under massive, ongoing construction. There was no lanai, only a slab of concrete with no railings. The apartment sliders were blockaded shut. We had no living room blinds and when workers periodically, unexpectedly decided to do work on the scaffolding outside, we had no privacy from their gaze. There were three cranes onsite and as many as a dozen construction workers each weekday from 8 to 5. During our 3 week stay, the construction noise ranged from annoying (sanding and hammering) to unbearable (jackhammers, rattling the dishes). Debbie is vice-president of the association. She knew all this but never told us. The description presently on the VRBO site has subsequently been changed after pressure by us. However, we relied on the owners' intentional misstatements to our detriment, which is civil fraud under Florida law and a felony if committed on an ongoing basis. At the very end of our stay, Debbie wrote us an email with her first and only apology, claiming that she never meant to deceive us, and that she was undergoing personal problems that distracted her from telling us the true condition of the condo before we occupied it. Had this been her first response to our first email, we probably would have believed her, and we might have felt somewhat differently about the situation. But the entire course of our dealings belie that innocent explanation, because over the course of 3 weeks, she continually tried to minimize the situation, trying to make it seem like no big deal and attempting to give us the smallest discount that she could get away with. She also lied to her board, falsely claiming that she had made us a previous offer to reimburse us 100% of our rent if we wanted to vacate the premises. She then lied to the board again by publicly (with copies to the board) offering to reimburse us 100% of our monies if we still wanted to vacate mid-vacation, and then privately reneged on that offer. If small problems occur during your stay, Debbie will probably attempt to resolve them. If, however, a larger problem occurs, you cannot count on Debbie to deal with you fairly and honestly. More generally, if honesty and fairness are important values to you, you will not want to rent from these owners. I am sorry this guest felt this way. We did everything possible to make things right for this guest, including giving him an entire week for free (which far exceeded what the condominium association has offered guests). What he wanted was to stay in our condo --- for 3 weeks entirely free! We had already agreed to a discount for the days stayed and to refund 100% any days he wanted to leave early, and that wasn't enough. He wanted to go back to Day 1 and be paid back for every day he had already stayed, on top of a free week. The construction schedule has been constantly changing due to conditions beyond our control. Our lanai is finished now and our incoming guests have full use of the private 32 foot lanai. I am brand new on the Board and this is specifically why I ran, to have more influence on the construction. The fact is, I am at the mercy of the contractors who posted construction timelines that were at least 2-3 weeks behind actual. This guest has twisted and manipulated every conversation along the way, we apologized his first day of arrival and throughout his stay. He told us day 1 he was writing a "blasting, negative review" and nothing we have done or said has influenced his stated purpose of jeopardizing incoming rentals. We just could not fix how mad this customer was at us. I have a policy of doing the best I can to make every guest have the best experience possible. Unfortunately, with this gentleman, no matter what my efforts were, this couldn't be done. Nothing worked. The review itself contains grossly inaccurate statements, emphasizing the challenge we had with trying to reason with this guest and agree on a satisfactory arrangement. If you look at all our other reviews, over the course of the last 8 years you will not find any that are negative. My guests find me easy to work with, honest, and they get a top notch vacation home and property. Other than the balconies being repaired and being able to use the Lanai (which we knew before we came) it was great.thanks so much for renting us this Condo. We loved it! Thank you for the positive review. We certainly appreciate your flexibility and understanding of the construction. We will all be so thankful when the lanai construction is complete (there have been several unexpected delays, however, the entire building completion is now projected to be done by April 26). We hope you can return next year, and enjoy a "finished" complex with great views and a location literally right on the beach! Probably the best condo on Siesta beach. Completely updated. Liked it so much we booked next February for the entire month. Owner was really easy to work with. Worth every dollar. Appreciate the great review. We love hearing back from our guests, and the most powerful testimonial is your next stay booked before you leave! Siesta Key is an island on the Gulf of Mexico overlooking the crystal white sands of Crescent Beach in beautiful Sarasota. With its own international airport (SRQ) or conveniently located between Fort Meyers (RSW) or Tampa (TPA) airports one can easily reach the world famous crystal white sands of Siesta Key. Theme parks such as Disney and Universal Studios are only a 2 hour drive away in Orlando.